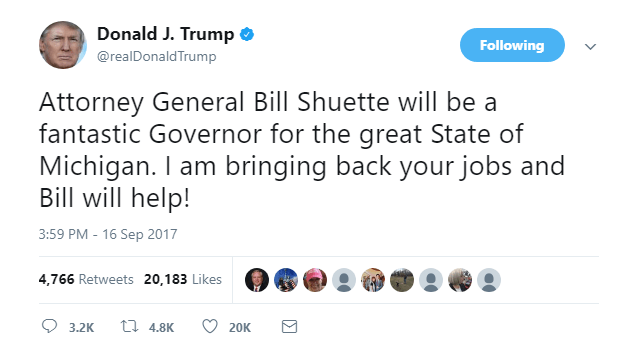 The president’s tweet supporting fellow Republican Schuette’s officially nascent gubernatorial run was heavy on praise within the 140-character Twitter limit but short one “c” on the correct spelling of Schuette’s last name. The spelling error was corrected early Sunday morning and, then, used for a fundraising email blast. The Twitter back-and-forth between the two was heavy on jobs and “winning” as Schuette appears to have adopted the mantra that helped Trump, well, “win” Michigan last year. Schuette’s campaign launch video very heavy on the same theme. Bill Schuette thinks the winning bet is sticking with Trump and even adopting much of his message. He’s determining he’s better off standing with Trump than not. The Trump tweet could also be a bit of payback for Schuette’s potential rival, Lieutenant Governor Brian Calley and, even, Governor Rick Snyder. Michigan’s Republican governor sat out the endorsement game last year, even after Trump wrapped up the GOP nomination. Calley, who’s widely assumed to be running for Governor, vacillated between support and nonsupport amid Trump’s blow-ups and braggadocio of being a sexual predator. Schuette did not support Trump in the primary, but once Trump won the nomination, Schuette was all in. “I ride for the brand,” he said. The Republican brand. Trump and Schuette both say they will bring jobs to Michigan. 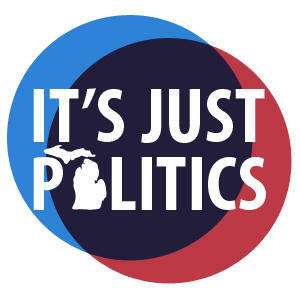 In fact, Bill Schuette says he will be the “jobs governor.” But what does it mean to be a “jobs governor?” Who could be against that? Pretty much every candidate for governor for the past, oh, 30 years, has said jobs - and schools - are their top priority. With an official jobless rate of 3.9 percent though, Michigan is at or near statistical full employment. But wage growth is certainly an issue. So is people disengaging from the workforce. Arguably, Michigan has more of an issue with people not seeking employment than people not being able to find work. The data suggest about one in 10 Michiganders who aren’t working want to be working, or want be working more hours. What will our gubernatorial candidates do to not just make more jobs, but to make finding work more attractive? And to help people who want to work more hours? Schuette will join Michigan Republicans when they gather this weekend on Mackinac Island for their every-other-year meeting, a leadership conference to plot strategy to win in 2018 when statewide offices and control of the Legislature are at stake. Whoever the nominees are, and this is true of Republicans and Democrats, they’ll have to show not just how they’ll create jobs, but how they’ll create jobs worth having. Representative David Trott announced Monday morning that he will not seek reelection in 2018. The announcement comes after speculation by various pundits and the retirement of two other Republican congressmen last week.